Thyroid surgery is known as a thyroidectomy. 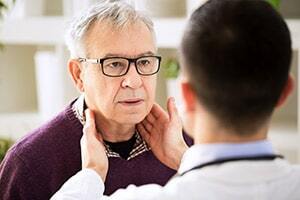 Two types of procedures are performed: a total thyroidectomy to remove the entire gland or a hemithyroidectomy, which removes half of the gland. The effectiveness of any surgical thyroid procedure depends on the type of cancer present and how much it has spread. Overall, the surgery is considered safe, but may have complications that include injury to the vocal cords and larynx (which could cause hoarseness, changes in the voice), injury to the parathyroid glands (which could cause low blood calcium. It is medically well documented that the risk of complications are significantly reduced but not completely eliminated in the hands of an experienced surgeon.